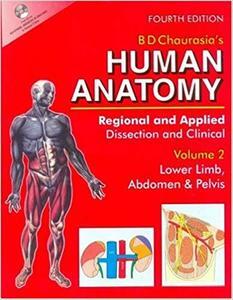 Human Anatomy: Regional & Applied (Dissection & Clinical) Vol. 2: Lower Limb, Abdomen & Pelvis (4th Edition) by Chaurasia B.D. Widely acclaimed as a standard text in view of its simple language, comprehensive coverage and attractive presentation, BD Chaurasia's Human Anatomy remains an ideal and the most preferred textbook in India and abroad. This edition now features freshly drawn diagrams in vivid colours with redesigned labelling and clarity of depiction.